A couple of days ago while I was crossing the street—with the walk light on—some dope decided he didn’t want to wait for a green light and drove through the red, across my path, not three feet in front of me. As he passed me he gave me a certain hand gesture, why I don’t know. I thought, “Geez, and I had the walk light!” Well, the hand gesture was a definite negative. And you know what this art historian does with a negative? He turns it into a positive art history story! 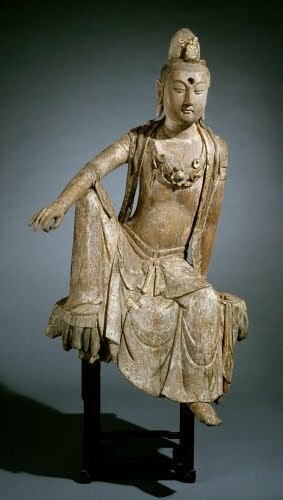 Ever since I first studied Asian art in college, I’ve been fascinated by the hand gestures carved or painted on images of Buddha or bodhisattvas. This tradition goes way back to the very first known carved images of the Buddha from northern India/Pakistan. This is an early example of the abhaya mudrâ. 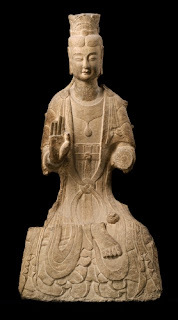 Representations of the Buddha and bodhisattvas are almost always shown with their hands making certain gestures. 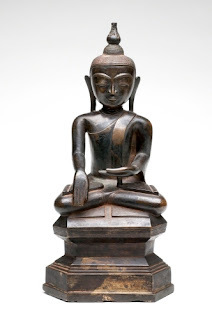 These gestures have been ritualized and stylized down through the history of Buddhist art. These stylized gestures have symbolic meaning relating to the Buddha’s ministry, and are known as Mudrâs. Mudrâ comes from the Sanskrit root mud, which means “to delight in.” They are a traditional part of classic Indian dance, Yoga, and spiritual practices. Representations of some aspects of the Buddha require a certain mudrâ, and some require specific objects to be held. The harina, or “lion gesture,” is always shown on the right hand. It is meant to symbolize peace and protection. The avakasha is a left hand gesture of leisure. Bodhisattvas are generally saints, people who have achieved enlightenment but forsake Nirvana to remain with humans to help them find their way. 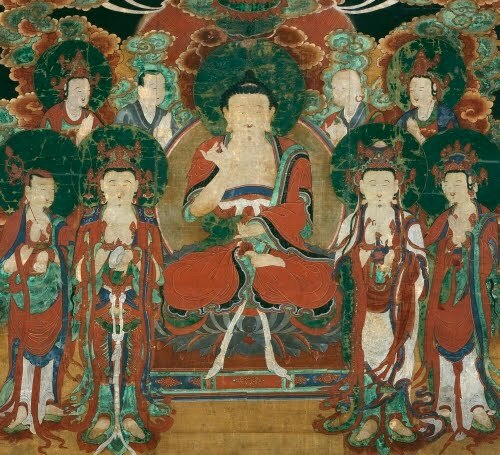 Arhats are considered “perfected people” who have found Nirvana. Bhumisparsha, always the right hand, is the “gesture of witness.” It pertains to the time when Mara—the demon, or, symbolically the sum of blind passions in humans that keeps them from enlightenment—tried to obstruct Buddha from obtaining enlightenment while he was meditating under the Pippala tree. He basically threw obstructions and temptations at the Buddha, finally challenging him to provide proof of his virtues. Buddha touch the ground and the goddess of the Earth gave witness to his virtues. 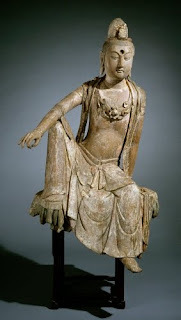 The leisure gesture shows how unperturbed the Buddha was with Mara’s machinations. This is the “gesture of meditation,” sometimes called Samadhi or Yoga mudrâ. 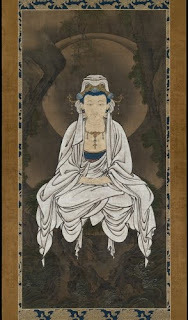 It is commonly used for images of the Buddha Sakyamuni (“sage of the Sakyas”, Buddha’s clan), Buddha Amitabha (the Buddha of “Infinite Life,” connected with Pure Land Buddhism), and Medicine Buddha (fully enlightened human, healer of outer and inner sickness). Kannon is the Japanese translation of Guanyin. In depictions of Guanyin, the meditation gesture emphasizes his capacity to help humans achieve enlightenment through perfected meditation. This is probably the most common gesture in Christian Western art. 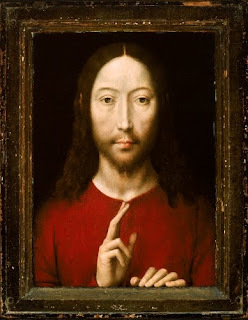 It is primarily associated with images of Jesus in his capacity to bless/forgive/sanctify.